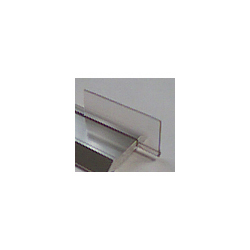 Vinyl water replacement blade for the barrier free shower water dam. The water dam can be easily removed from the shower base, a new blade inserted and the track re-installed if a caulk was originally used. The frame of the shower door (if you have a full shower door installed) must be removed to complete the blade change.